Inspired by a couple of talks given by Prof. Gilly Salmon at the 5th Coursera Partners’ Conference in The Hague in March 2016 I have been working on a way to take her ‘Five Phases’ of online course design and turn it into a ‘workshop’ model that could be used to help design courses, and to compare courses, their affordances and learning outcomes. Her idea was to give educators a simple, approachable way to think through the design of a ‘Technology Enhanced’ course. Fig.3 My interpretation of how Gilly Salmon uses coloured blocks to visualise the ‘ideal’ or ‘typical’ components of an online or ‘technology enhanced’ course in tertiary education. This is one the many approaches that I am familiar with and in some instances have used to design a course, from packs of loose, printable cards developed by JISC that were used in a OLDS MOOC I completed, or flowcharts called ‘Swimming Lanes’ used an online App through the Open University, during one module of the Open University’s ‘Master of Arts: Open and Distance Education’ (MA ODE) or on a white board in an ‘industry’ in e-Learning Network (ELN) workshop I attended in London for corporate online training. Fig.4 A pack of cards developed by JISC to assist with course design. The goal is always the same: to have a blueprint that can be shared with colleagues and a team that will build the platform before ‘populating’ it with content (and knowing what kind of content this will be: text, rich media, game/activity, assessment etc). This is something I am familiar with as a producer working in corporate training, video and interactive production. I moved from linear treatments and scripts and to packs of storyboard ‘blueprints’ that would show, what Gilly Salmon would later call ‘e-tivities’. These storyboards would also show the buttons and links that would appear on the DVD or computer-based training we produced. Fig.5. The Creative Workshop that I ran at the Open University Business School to resolve problems with running multiple LinkedIn Groups for current students, alumni and prospective students. While at the Open University Business School (OUBS), I completed their MBA module ‘Creativity, Innovation and Change’ and was introduced to dozens of techniques for helping people unravel a problem or come up with a creative way of doing things. It has been exciting to apply this in small groups, running workshops to solve problems collectively and to come up with often surprising, actionable results – that everyone felt they had contributed to. I have shared the techniques, including the ‘Bible’ of creative workshop techniques with the founder of The School for Leaders to use in their summer schools. Fig. 6. A set of the current tabs on the Western Front Association website. As the digital editor I upload all items, sometimes as many as a 30 a week. More recently, my part-time role as the Digital Editor for The Western Front Association (The WFA) I have written and assembled, added modified images, links and video to a MailChimp newsletter that then went out to our 6,500+ subscribers while posting some 15 articles and events to the website and feeding some of these to The WFA Facebook Page. Meanwhile, 18 months into this role, I am working with the Executive Committee of The WFA to replace the current website. Until now I have been working with a web agency in Dundee working largely online and through a ‘ticketing system’ for tasks to be undertaken. The brief, that I wrote, is for far greater focus on The WFA remit of: ‘studying, learning and research’. To this end, alongside completing, part-time, an MA in the history of 1914-1918, I am in continual contact with academics and their support teams in the UK and abroad endeavouring to represent their work, by sharing and publishing events and papers. During the week I will correspond via 60+ emails and one Skype call. Every couple of months we meet face to face in offices in London. This kind of team working, as a producer in TV and video production and creating websites, has been matched by some volunteers roles, for example, as the Chairman of ‘Wave Leisure’ the group that took over leisure facilities from Lewes Town Council, by multiple roles in a 1,000 member swimming club working with colleagues, parents and swimmers (children through to Masters), while currently, by way of example, I am working with a group in Lewes to research, write, then present in talks and through displays in shop windows the history of Lewes during the First World War. Another, disparate involvement in ‘academia’ has been my working on a three day conference on the political philosopher Plamenatz, using a handful of names and authors to build a database and get in touch via social media with potential speakers and event attendees for the University of Oxford. Meanwhile, over the last week, inevitably, with my interest in online education, I hold an MA in Open and Distance Education from the Open University (2013), I am taking more than a close look at the approach taken to blended learning at the University of Wolverhampton where I am a part-time student. The OU had its own e-portfolio ‘MyStuff’ that I personally used religiously only to have it deleted and replaced with a generic platform – an early version of Mahara. Wolverhampton use PebblePad. I use all the different platforms, as a learning exercise and to mentally acknowledge their presence should I need them later. My experience and preference is to use a student Blog platform that provides the simple three options of publishing 1) privately 2) to my faculty/student group only or 3) to the world. You have the benefit of putting all your study ‘stuff’ in one place, then to share with the faculty if you are working on a collaborative task and also to share, more expansively thoughts and ideas about the life, the university and everything. My interest in online learning has seen me invited by the University of Wolverhamtpon to take part in reviewing of the School of Arts’ ‘Offer’ and the university’s adoption of a new platfrom, Canvas, later this year. Fig. 8. The current OU Student platform: simple and clear. My OU Blog usage. My OU Student blog, which I used extensively, over three years has several thousand followers and has been viewed 1.7 million times. I still write in it to keep up with former students and tutors. I also rely on it to find tagged papers, infographics, and notes on every subject covered by The OU MAODE. Other ‘databases’ I use include Picasa (now Google Pics) where I have many thousand screen grabs related to all manner of subjects, not least seven distinct ‘albums’ related to ‘E-Learning’. Finding visual references or ‘aides memoire’ invaluable I have in the past used FlickR not only to save photographs online, but to share them and gather information and contacts around them. I still used Pinterest extensively, gratuitously grabbing and assembling images as I read and explore, while in the past, I have also made extensive use of Stumbleupon. Short of ‘lifelogging’, that I have tried, studied and discounted, I find that with devices, apps and platforms one can recreated a fraction of the contents of one’s brain online: in scale though, it is, for the moment, only an ‘aide memoire’. I wonder if in time, ‘A.I’ could make this smart? I hanker after an Alexa like presence that knows me better than I do, a ‘personal assistant’ for the 21st century. My history with Pinterest has been as an ‘aide memoire’ and collection of curiosities. Galleries of images on a theme, held and built upon in one place are a quick-fire ‘concept board’ for the inventive mind, but also of practical use where an image is required to support a particular article. Recently looking at this I wish, having pinned one, I’d gone back and worked with dendrograms: I an see their value for clustering, and therefore making sense of ideas; perhaps for writing something like this, but certainly for a formal, academic essay. I click on the image of the dendrogram I had saved and in an instant I am reading an article on ‘How we designed FutureLearn’s new course categories’ on the FutureLearn website of how they created categories for their website. In turn this shows me what I do and do not understand about dendrograms amd their creation: I am familiar with ‘card sorting’ and ‘closed card sorting’. Now I could plan one to be created online using ‘Optimal Workshop’, which includes tools such as ‘Tree Testing’, ‘Card Sorting’, ‘First-click Testing’ and ‘Qualitative Research’. The Open University Business School web pages were put through this process. A number of people, fitting the ‘persona’ profiles of an OUBS student were paid a fee to take part. The ‘Human Computer Research Labs’ can be booked following these guidelines. I use and am familiar with the affordances of their learning platform ‘WOLF’ and have identified strengths, weaknesses and opportunities which I am sharing both with the chair of the MA program and with university learning support team. The problem with its use for the course I am taking isn’t technical, but human: tutors, students and others need to respond to comments; best practice will be picked up through use, but for now some tips are needed: dont give the title of your comment as the date of the Saturday Course – everyone does this and as a list it looks meaningless; starting a discussion is one thing, responding in a thoughtful and constructive way to others matters more. ‘Listen’ to what a person has written, and respond to all of it. Keep of your agenda, be considerate and respectful of theirs – you’ll have your chance. Treat it as a reciprocal experience. Treat it like having all you coffee room discussions recorded and typed up. It should be friendly, even rambling, open, constructive and engaging. You cannot bore people into taking part. Not one student posting to the discussion since October 2016 has had a response, neither from tutors, nor from fellow students. I can try to act as a catalyst to invigorate this, however, if my lone voice then appears and responds with comments to 90% of the threads another problem is created. Most of this knowledge I have gained through experience over many years, starting in 2000/2001 with ‘Friends Circles’ on the Diaryland Platform, then ListServ with The OU in 2001, but in particular through the many modules of the MA ODE. I can now look at papers on ‘student engagement’ or call up a ‘Poster’ and talk I had with an academic at the 5th Coursera Partners’ Conference in 2016. A significant failing of the Wolverhampton MA course, which says it uses ‘blended learning’ had been to have a proper, hands on induction, face to face as well as online (it is ostensibly a residential, lecture-driven course). As I write this, the course chair and I on the MA course at Wolverhampton are exchanging thoughts on the discussion forum. I believe I have credibility because I know the subject and so can contribute at that level, but also, because I am so familiar with this kind of setup and know what makes them work: keeping the questions open, reading and responding directly to what others have said (as you ought to do if they were talking to you face to face), and keeping the tone open, supportive, professional and on brief – unless you create informal ‘break-out’ spaces. I also know that having posted a few replies, however great the temptation, I need to stand back for a couple of days to give others a chance to come in, and then when I do return to respond to one or two, but not all of them: to let some of the discussions purposively be picked up and carried by others. Fig. 12 Studying 3D production and design post-graduate students had to grade each other in terms of ‘collaboration’ and ‘team working’ those receiving the lowest scores given especial attention to bring them ‘on board’. There are universities that successfully have MA students contributing to undergraduate discussions, and doctoral research students contributing to MA discussion groups. All would benefit from a workshop on the dynamic of these and the psychological impact on student behaviours if you are too dominant, or flippant, or dismissive. The typed word has multiple tones because the reader invents it. As a student I have now been in thirty or more of these, online learning groups, all the way through the OU MAODE, but also in MOOCs, particularly from FutureLearn, but also from several and different Higher Education and Commercial MOOCs I have taken since: Oxford Brookes, Coursera for example. There is a pattern of use, or no use at all. Where a group of students regularly ‘hang out’ the exchange can be extraordinary: constructing meaning, building confidence, acquiring knowledge and having a laugh. I am currently an online mentor with the Open University, and also a mentor (on campus) at the School of Communication Arts (since 2011), though by far my busiest, most fulfilling and insightful experience (daily if I wish it to be) is as an online mentor with Coursera. I recently shared issues with engagement in a Coursera ‘Hang Out’ and found myself recalling some of the greatest successes at The OU: a tutor who posted a different picture of a ‘Water Cooler’ each week and used this for students to have a ‘free for all chat’, which gave them confidence with the platform before going back to the academic threads; and a student in my tutor group, soon after they had been launched, getting us all to join a ‘Google Hang Out’ for a pajama party – not as salacious as it sounds with students in many different time zones (and cultures). Coursera are doing this too: a recent ‘off campus’ hang out having us bring our favourite ‘food’ to the hangout to discuss: interestingly with Coursera Mentors from Egypt, California, Chile, Germany, the Netherlands, Argentina, Canada … England and Wales. At Wolverhampton I have also put myself forward to support the creation of online materials for this and other courses. I have done this before, asked by Creative Skill Set to join a panel advising them on the creation of a number of MOOCs they were part financing via a number of UK universities, and also advising Design & Art Direction (D&AD) after they had received a management consultancy report advising them to move some of their workshops and distance learning ‘products’ online. I was introduced to the work of Daphne Koller and Coursera as an MA ODE graduate student in 2010/2011. The results from their earliest courses have shaped their thinking since: close analysis of how thousands of students struggle pinppoints where the educators need to improve how they present and explain a thing (which benefits students on campus too) while experiments with peer reviewed and tutor graded assessments were telling: far from ‘cheating the sytem’ or just getting it wrong, students tended to mark more harshly than the tutor. Peer review works at another level too: by assessing the work of others your own knowledge deepens. They do say that the best way to learn a subject is to teach it, after all. I have since completed several Coursera MOOCs on ‘Learning How to Learn’, ‘Photography’, Search Engine Optimisation’ and ‘Creative writing’. It has been a fascinating and rewarding journey to use the platforms, experience how it works, to see how Coursera are constantly improving and adapting (and contributing to this) and to have become (after training) a Coursera Mentor (since August 2016). The mentor is support, a moderator, and a technical and subject guide. The support we get includes regular emails and newsletters, as well as weekly ‘Hangouts’. A bit like a ‘mentor’ but with more ‘powers’, I am a moderator on various groups on LinkedIn, a moderator in the eLearning Global Network (34 k+ members) but also the moderator and founder of ‘Swim Club Teachers & Coaches’ group (1.4k members). In these groups, and initially learning from Thomas Garrod in the eLearning Global Network, I came to develop ‘best practice’ when seeding and responding to discussions. This is something I took to The Open University Business School (OUBS) where I took over, developed and started four LinkedIn Groups in turn for alumni, present students, prospective students and the newly formed ‘Business Breakfast Network’. (Memberships ranging from several thousand to zero when I set up the ‘Business Breakfast Network’). These groups were used for multiple reasons: maintaining interest in The Business School, supporting learners and acting as a hub and a learning/sharing platform, directing prospective students to a series of webinars I set up and beginning a corporate, business network. In each case I developed and grew group numbers and participation. In all these instances, including the lead on a programme of webinars aimed at prospective students, I worked with senior and junior academics from OUBS, and with administrative staff. Fig. 14 A video producer (writer/director). Interviews, conferences, lectures and bespoke training. Over the last week, I have responded to five Coursera students on MOOCs, and taken part in two Coursera Hang-outs. Often my input is to nudge the student along, even, simply to indicate that there is someone listening. Issues with assessments are not unusual: people get miffed if they don’t pass the formal, graded assessment at the end of the week first time and can blame the system if they don’t get the grade a second time either. I am loath to point out that I rarely got through one of these multiple-choice quizzes first time, the questions shuffle each time you take the ‘test’, you are also directly, a little clumsily I would say, directed to the part of the course that might help you get the answer correct. In one instant it took me 7 attempts, another 11 and time out to go back over two weeks of learning material, and by then, the option to ‘reset’ the course by two weeks or try and catch up. Most Coursera courses now start on a rolling basis every two weeks and as a student you can, if you get stuck or delayed, reset to an earlier ‘presentation’. This sadly does impact on the task of creating any student bonding in a ‘cohort’ and so reaping the benefits of camaraderie, collective effort and collaborate, constructed learning. One of the hangouts is with the Coursera technical and support team based in Mountain View, CA and a ‘Chill out’ of a tiny fraction of the 1,900 Mentors worldwide. It is fascinating to learn that the University of Michigan is aiming to have 200 of its courses online by the end of 2017, with 83 already online. (I mentor one of their MOOCs). They are splitting content between Coursera and EdX. This is seen as a valuable way forward for educators for students on campus, and to build and support students ‘at a distance’. Fig.15 A break-away session on how to create, manage and moderate an online forum used by students from across the world. Coursera Conference 2016. Attending the 5th Coursera Partners’ Conference in March 2016 I was able to hear academics speak, network with them, and in several instances take part in early-morning ‘creative workshops’ with them, in two cases initiating the topic we explored, namely ‘Resistance of universities to online learning’, and ‘Use of video in online education’. I could also build on my knowledge of how Coursera uses student data to improve courses by identifying sticking points; analsysis and change are part of their culture, part of what they see as a ‘movement’ to bring education to the world. Fig.16 Annotated Post It notes used during a Coursera workshop which led to my own conception of how ‘Massive Demand’ feed into course programmes ‘on the ground’. It was fascinating to learn how much corporate ‘partnership’ is occurring with academics, particularly in business schools, and how academics are adapting to the ‘flipped classroom’. Ten months later I am still reflecting on the 30 or so ‘Posters’ presented by a myriad of academics at Coursera who have been testing ‘technology enhanced learning’ in institutions around the world. Even something as subtle as where to place text, whether subtitles or annotations, on video were fascinating. Fig. 17. Barb Oakley presenting ‘Learning How to Learn’ – the biggest MOOC to date with over 16 million participants. I came to be at the Coursera Partners Conference, my delegate’s fees reimbursed, as I was, and still am, a fan of ‘Learning How to Learn’ and its author and presenter Barb Oakley. Personally, I think her delivery is a model for any lecturer wishing to create a ‘flipped classroom’. She shot all the video herself in her basement with a green screen on a budget of $5,000. As The OU TEL academic Martin Weller would argue, it was ‘good enough’ – the kind of video shoots I was responsible for in my former career are not necessary. A lecturer to camera does not have to be a multi-camera TED lecture event, or a BBC documentary. They simply need to be prepared, savvy, knowledgeable, open to constructive criticism and enthusiastic: and in due course, be prepared to replace bits as a better way to explain or show something is thought of. The Coursera platform is extraordinarily smart and always adapting and improving: as a mentor I complete a weekly short survey and a monthly in-depth survey, let alone feedback issues with the student experience at every step of the way. Recommendations from mentors, I have found, are swiftly fed to the ‘Tech Team’ and adopted. This is a four part course that I completed with a score of over 80%: I am familiar with the modules, and can at any time go in and follow it as a student should I need a refresh. A basic component of the Coursera experience is for a short video of ‘knowledge acquisition’ followed by short formative multiple-choice quiz, which you have to repeat and pass to 80% before you can progress. Some students baulk at not getting it all right first time; so long as there is nothing wrong with the questions and content I persuade students that the effort required to get the answer right is very much part of the deeper learning experience. I was following the weekly Friday Coursera ‘Mentor Hang Out’ just before I came to write this. They have been holding these twice a week for some months. Beyond the blog and hoping that people will read and comment, and beyond the tutor supported forum where you hope they and fellow students comment, the beauty of a ‘hangout’ is that it gets people together in real time in a dynamic that is quite different from from a face to face seminar. As an alumni of ‘Learning How to Learn’ I receive, follow up on and respond to the weekly newsletter on dates, books, developments and insights. Fig. 18 Mash-up promoting ways to put the ‘Oxbridge Tutorial’ experience online. I am a little more than a passive alumnus of the Oxford School of Geography, attending lectures from time to time and in touch with the faculty about e-learning. I also take advantage of attending my former college and wider university events, including attending open lectures at the Oxford Institute of the Internet (OII) and Said Business School if it feeds my knowledge. Oxford is moving towards creating MOOCs on EdX after years of consideration, committee meetings and procrastination. In March I have a chance to hear more about this from the University’s Vice-Chancellor at a college conference. My fascination has always been on how to recreate the ‘Oxbridge Tutorial’ online; with small group hang-outs this has become possible, so long as they are made an obligatory part of a course and a carefully managed. Fig. 19 Part of a corporate presentation attended on the functionality of Moodle. My interest in corporate training a member of the Learning Skills Group (LSG), going to their annual conference ‘Learning Technologies’ (in Olympia, London), taking part in regular webinars since 2010. Introduced by a fellow student on the MA ODE I have also been dropping into an Australian ‘hang out’ for teachers in Higher Education since 2014 while the skills and experience I gained using LinkedIn groups I gained from eLearning Global Network and their monthly hangouts (I became a group moderating four years ago so can delete, move and edit posts from others too). You learn how the dynamics of an online group works, something I had become familiar with though such groups and the different platforms they use at The OU. My interest in FutureLearn has been no less great that my interest in Coursera : I took their first FutureLearn MOOC on Web Science (and consequently applied to Southampton to undertake doctoral research, title ‘Can an email-prompted web-based e-learning platform aimed at undergraduates in the UK with moderate to persistent asthma improve compliance to their prescribed preventer drugs to 80%?’. I went on to complete 11 FutureLearn courses and when Creative SkillSet decided to create MOOCs I was recommended by the Dean of the School of Communication Arts and joined the panel of advisors helping to fashion MOOC proposals from the likes of Goldsmith College and the National Film and Television School. My interest in ‘Technology Enhanced Learning’ began when I was working as a producer for UK corporate producer TVL who were beginning to migrate linear-based video training to interactive formats. This saw me working with ‘educators’ in industries as diverse as Nuclear Fuels (Sellafield), Banking (Standard Life and NatWest), Law (The Crown Prosecution Service and legal publisher Legalease) and many others. A team, that I lead as the producer, included an instructional designer, writer (I often wrote the scripts) and in-house team of editors, graphic designer and ‘outside broadcast’ video teams. Working closely with the client my role was to help shape a vision for the work, then lead and represent the scripting and storyboards for what were in effect at first the means to replicate lectures, workshops and ‘on the job’ and ‘just in time’ training. For example vignettes of video were shown then questions asked and knowledge tested. As levels of sophistication and budgets increased 3D graphics and animations were used to help explain a process, machine action or flow of information. Feedback forms, then behaviour using computer-based learning at the desk then modeled how changes would be made. Thus I have found myself working at the THORP nuclear reprocessing plant on safety training, developing an interactive DVD on banking for Standard Life, creating training for NatWest on how to handle a bank robbery and bank manager kidnap while producing a course on ‘The Art of Legal Negotiation’ for lawyers. I have at times worked in broadcast TV, as an assistant producer, even sound engineer, offline editor and vision mixer. Then, as now, I have no fear of learning new skills whether putting images through Adobe Lightroom, cutting audio with images in Camtasia, learning a new web platform, such as WordPress and Joomla, shooting and cutting video and loading this to YouTube and embedding it onto websites or into a newsletter using MailChimp, or using a collaborative learning and sharing platform such as Cloudworks. With the move to a web agency in Brighton it was clear at the time that the ‘rich’ media of 3d computer graphics and drama-reconstructions could not be recreated online. In the first ‘educational’ platform I worked on (as its Producer) I worked directly with the client FT Knowledge and our creative team to create modules for an MBA programme which used animations, text, audio and multiple-choice questions as part of each module. Recognising the need to improve my knowledge I joined what was then the Open University’s MA in Open and Distance Learning – all learning ‘at a distance’ with a crude ListServ forum and physical books. Fig. 21 Taking part in an OU wide research project with academics and other staff to identify key OU ‘Personas’. While taking the renamed Masters Degree in Open and Distance Education’ I successfully applied to work at The OU and was based in Milton Keynes. Here I was surprised, though delighted to become quickly involved in an expanded role that had me sharing the ‘OU Student experience’ in meetings and workshops to heads of faculty, assistant lecturers and individual academics. Essentially, I was taking them through the affordances of platforms and tools that they had been wary of using. Meanwhile, I picked up two groups on LinkedIn for the Business School and began two more: one for prospective students and a fourth for the launch of the Business Breakfast Briefings. Familiar with LinkedIn I ran, supervised, moderated and seeded discussions and help build one closed and one open group into the 1,000s. Fig. 22 I have studied and followed SpacedEd (now Qstream) since 2010. I have twice interviewed its founder/creator Dr Price Kerfoot and based my PhD doctoral thesis on using the SpacedEd platform to test compliance training with asthmatics. Completing the MA ODE, I elected to complete two further modules in preparation for applying to undertake doctoral research. During my studies I had become fascinated by what was then a new platform developed at Harvard Medical School by Dr Price Kerfoot called ‘SpacedEd’ which used the simple mechanism of very carefully scripted multiple-choice questions sent to a mobile device. My research proposal was to use SpacedEd to educate people with mild chronic asthma to improve compliance to their drugs and to measure learning effectiveness by an improvement in lung function. I firmly believe that there are many situations, and subjects, where knowledge has to be acquired particularly with first year students before it can be applied which would suit learners at all levels. Creativity and innovation can put you out on a limb. I am a compulsive ‘early adopter’ who wants to see, use, judge, and experiment with every new app, platform or tool. I therefore have Alexa from Amazon and am confident though currently underwhelmed: she doesn’t take dictation or speak French. Historically I was early to blog in 1999, coding my own pages until I joined the platform Diaryland, and then quick to try each platform as it emerged from LiveJournal through to WordPress (on which I have several blogs. Only this November I loaded diary App to my iPad ‘My Wonderful Days’ to support my desire to keep a daily journal or diary again: I never miss a day, and use it, to keep some kind of track on what I read, see and experience every day. There is huge cumulative worth to this: I find I forget just how many books I have read, for example, even where I have made notes so these too will go into a blog and tagged. I have studied and review people and tools for ‘life logging’ and feel confident that they can be dismissed as giving little support to the learning experience: the student needs to be making choices to ‘grab’ or store information. The benefits of ‘lifelogging’ are for those with dementia or Parkinson’s Disease to help bolster weakening short-term memory. Otherwise, the healthy brain is designed to ‘forget’ and we should be allowed to – students encouraged to find ways to repeat, review and re-use thoughts and knowledge they need to store in their long term memory. I am quick to try new apps and platforms, whether Prezzi or QR codes, ListServ or Google Hangouts, ePortfolios and multiple-choice assessments, (SpacedEd, now QStream). I rave about the language learning platform Rosetta Stone having greatly improved my grammar, vocabulary and especially my pronunciation with it. I recently signed up to Yousician to try and get my guitar playing skills a bit better than bad. A couple of the stalwarts of my working day are Simple Minds (for mind mands) and Studio (for annotation images and charts). I also have used a variety of idea/storytelling supporting tools such as PowerStructure and Final Draft (though ostensibly these are for writing novels or screenplays). Creativity regarding online learning means many things: simplest of all it is pragmatic problem solving, dawning upon experience and a willingness of different minds to look at new ways of doing things; creativity also standards and quality controls, a platform or app like a chair can be both functional and beautiful, it is shocking how many times a platform or app can be neither thing: it looks terrible and doesn’t worse, or even if it works it looks terrible and leaves users lost or demoralised: ease and joy of use is crucial, as well as relevance and something being embedded in the learning experience as a compulsory component : make a thing optional and most students opt not to use it. Fig. 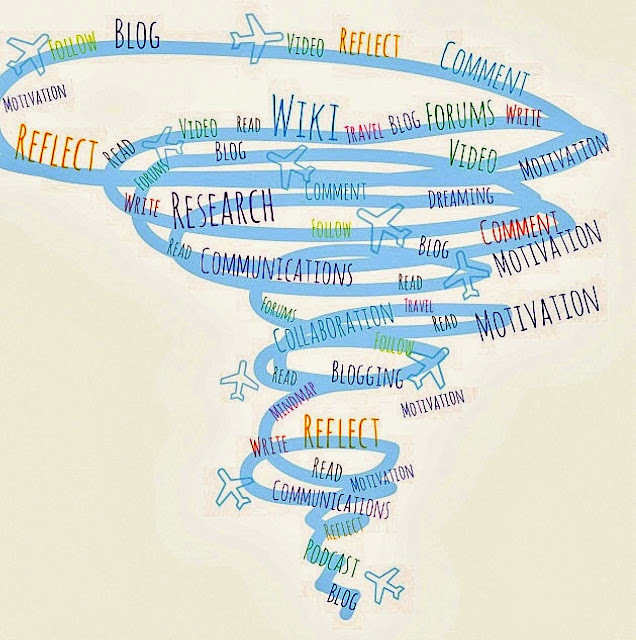 25 OUBS: Recording lectures and seminars (including Cherie Booth’s inaugural lecture, marketing planning foe web development and organising webinars. At the Open University Business School, as with the Western Front Association currently, I respond to and support a myriad of people helping them to make the best use of the platforms we have available for them. There is often a need to persuade, to present, and the assist and nurture where people are hoping to, or are expected to use a piece of technology themselves. Fig. 26. Drawing on the research and writings of many specialists, past and present. Not a teacher, though I have taught in primary and secondary education, and in higher education given talks and run workshops. With my children now in or starting university I cannot help but pick their brains about the learning experience. My son is using FlickR to build a portfolio of work, while both my son and daughter are disappointed by the percentage of students who don’t do any work. Not a teacher, though I have been a professional swimming teacher and coach since 2005 and as I gained professional qualifications and learnt through traditional methods : workbooks and seminars, I regularly advised the Amateur Swimming Association on e-learning, preparing proposals and scamps on best use of video. Not a teacher, though I took a six week course with Oxford Brookes on teaching in higher education (and gained a distinction – and 10 credits). Not a teacher, though I took an OLDS MOOC and ended up working collaboratively with educators from the university of Lincoln to devise a MOOC on video for educators. Not a teacher, though I devised a use of QR codes in teaching the First World War. Not a teacher, though I devised a research thesis based on studying a cohort of undergraduates. Not a teacher, though having completed the MA ODE and further MA ODE OU modules I have repeatedly studied and consider how a wide array of tools and platforms could or do support educators. Not a teacher, though taking a close interest in the work of Kineo I gained an insider’s perspective of how learning platforms were developed for ‘City & Guilds’ worldwide. Though not a teacher, I see myself as an ‘educator’ and facilitator, an informed, personable enthusiast, always ready to push my own studies further, including to doctoral research. Whilst endeavouring to keep my skills and interests up to date, I also have a career of relevant and valuable core skills from preparing a creative brief and chairing workshops, to presenting and championing an idea, to supporting one to one or presenting at a conference, to producing video and interactive projects, even operating video cameras, editing and posting content online. I believe I would make a credible, valuable member of the Technology Enhanced Learning team at the University of Sussex. This online course from the University of Cape Town has been fascinating. I could study neuroscience or get drunk and paint a mural on the side of the house like Jackson Pollock, but I don’t think it would get me any closer to finding an answer … even if I had fun doing so. To sum it up for all of us, to excuse and explain all behaviour from Gandhi to Hitler, from Hockney to Terry Gilliam, Richard Dawkins to Robert Winston, I simply think that each of us is unique – yet ironically society and others repeatedly fight to contain us. 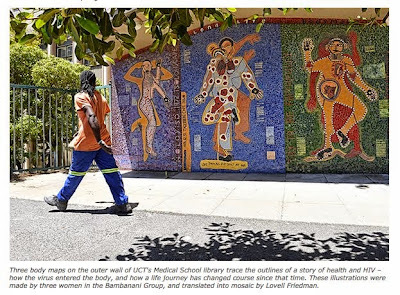 I’ve been prompted to express this by a question posed to participants on the course ‘Medicine and the Arts’ from the University of Cape Town on FutureLearn. An utterly absorbing, heartfelt conversation so sympathetically and convincingly shared. Worth of many return visits and further deep study. I’m driven by a limiting interest in everything. My curiosity knows no bounds – which is limiting, as it might be enlightening. It is easy to visualise the dog chasing its tail, though in my mind, excusing the vanity and narcism of it I see myself more as that omnipresent foetal child from the end of Stanley Kubrick’s 2001: A Space Odyssey. Start Writing Fiction is a FutureLearn Course. Its content makes up part of an OpenLearn Course. It is a thread in the Creative Writing Course here at the OU.Three months on having completed the course it is about to repeat. I’ll be there. We learn through repetition; not simply learning by rote. We learn through passing through the same loop over and over again. There is nothing so special about graduation, gaining an MA, a PhD or achieving the lofty status of ‘professor’ so long as you are willing to climb, as if on a thermal, one focused ever ascending loop seeing the same thing over and over again in new light, until, through insight or height from the ground you see something new and have something new to say. There are some key lessons to learn from ‘Start Writing Fiction; (SWF)’ though it is never the whole story – for that you need to sign up to a graduate course on Creative Writing. There’s plenty to work with though. I look forward to being reminded what matters. It kicks off again on 27th April and runs for three months. Reading matters as much as writing. The precocious child who read copious volumes and gets into literature in their early teens has an advantage. I was slow to read and reluctant to read. The only novels I may have read as a child were forced on me through school. Even in my teens as I read ‘Great Expectations’ and ‘Silas Marner’ for O’ Levels and ‘The Mayor of Casterbridge’ for A’ Levels I did say like a parrot: If I picked up an ‘B’ grade at both levels it was only because I regurgitated precisely what I had been tutored to put down. Over three decades later, 33/35 years later to be exact if I check my diary from that time, I am reading Dickens with fresh eyes. My late mother bought me a second hand edition of all the Dickens novels. I never read one. I now have ‘Great Expectations’ for free courtesy of ‘Project Guttenberg’ on my Kindle. I am reading it with lessons from ‘Start Writing Fiction’ in the front of my mind. SWF concentrates on the key, though not only component, of good writing: character. I am chewing over every line of Dickens with a rye smile on my face: I see what he’s doing with Pip, with the escaped convict from the hulk, his older sister and her husband Joe the Blacksmith, with Miss Haversham and Estella. If ‘character is plot’ then the plot moves, in a series of steps, over the heads of each character. We are carried by Pip with repeated moments of laugh out loud insights to a child’s perception and feelings for the world. How had I not see this before? For the umpteenth time I am doing what doesn’t come naturally to me: I should be painting, not writing. Intellectually I feel like the child who is left handed who had than arm tied behind his back as a child to force him to write against his will with his right. I have managed well enough, but it is against character and it is too late to correct? I need to work with words as the text that describes what I see. Text has other values too of course. It can carry a story beyond a single canvas. Every line of ‘Great Expectations’ is in Pip’s voice, written as autobiography much later in life, in the moment, capturing for now, his wonder, fear, feelings and hopes. It helps me enormously as I try to construct a story of my own set in the couple of decades 1966 to 1986, rather than 1820 to 1860. Characters don’t change, technology and society does. It helps me to contain my imagination and fears as I feel it falling apart. Character will hold it together; each character needs to surprise. I wish I could find the link to the BBC Radio 4 programme in which an author, Michael Morpurgo or Alexander McCall Smith talks about writing; it was on over the last three weeks. Or was it on TV?! Tips and devices were spoken of, but what had most resonance for me was the idea that an authors wonder at even the most mundane creates interest for the reader. I used to discount Dickens as old fashioned; I now feel that I am reading Dickens with the same wonder of someone who has broken through the fog of a new language and is becoming fluent. Can I now translate this into my own writing? For now the juggling game I am playing is my writing in one hand, Dickens in the other. Sharing where I stand matters hugely. Knowing that others are following my journey and are supportive matters: it keeps me going. Being online matters. It is the next best thing to standing on a soapbox in the local park and reading passages from my efforts. Feedback matters as it guides you. On this retreat last September we read out our work, actually Susannah read my piece for me as I wanted to hear it from a different voice. We were around an open fire in a cottage in Devon. Telling stories around a fire takes you back to the origins of storytelling; what must you say to hold their attention, to keep them entertained, to make them cry (I did with that one), to make them laugh, fear, hope, clap, get angry … and ponder, even panic over the outcome. In that story I had a soldier in the First World War slowly sinking into mud, up to his chest and neck … screaming for life. Marshall McLuhan had a lot to say about the medium being the message when TV came along in the 1960s. I always put the message first and with online courses (MOOCs by another name?) I would liken them to books or TV programmes … there are many as you can imagine for every kind of audience, by educational attainment, and subject. I agree that learning is inherently social. Having got kids who could touch type before they could handwrite and use the Internet before they could use the telephone I have witnessed them learn, collectively, online in various ‘online’ activities – almost always with the very same people they are seeing during the day in class. Platforms, such as FutureLearn are tailored for this – EdX, by way of contrast is not. Learning outcomes must be an important raison d’etre for MOOCs, but I don’t see this at all as being the only reason institutions are producing them. They are seeking to attract students to courses that are either taught on campus or online at a distance. If a MOOC on Aviation Comes of Age in the First World War attracts 5000 and 500 finish the course 50 buy certificates and 5 sign up for the MA then they have doubled their student intake to a niche subject. I’m making a wild stab at the numbers: I don’t know what they were. I can hazard a guess by the activity in the discussions. They are producing them to learn from the experience, gain the in-house knowledge and support their educators and producing online content for their regular courses too. The numbers I do know are for the FutureLearn course ‘Start Writing Fiction’ which had 23,000 students to start with and bucked the trend by having 25,000 in week two. I can only guess at the numbers who made it through to the end based on the crude stats we have for ‘MOOCs’ to date. A new outcome for this course is that nearly two months after it officially ended people are still starting and still completing the course: I know this as I set up both LinkedIn and WordPress groups to support them and actively return to the course myself to refresh ideas and contribute to reviews of work submitted and discussions with those there. By way of comparison, the University of Southampton WebScience MOOC is aimed at PhD candidates: I should now as I was one of those candidates and interview to study a PhD. I had no answer for my not having a medical degree or having done a randomised control trial before. The ‘Oxbridge Tutorial‘ is commonly used in the UK and is a tutorial system used at Oxford Cambridge, Bristol, Durham and LSE I believe. Is it also the Socratic Method? The method of knowledge transfer may be the same but numbers are lower 1:1, or 1:3 max. A MOOC experience that works, at this level includes both Socratic and Madras approaches, for better or worse. Worse according to Oxford’s Internet Institute (Rebecca Eynon) where cliques form around the leading student educators that appear to block out others. PhD students may have to study on their own, but do they want to? MA students don’t. The Educators I know at university want to teach too. Digital literacy, like any kind of literacy matters. I engage those who have been online for a decade and those that are newcomers. They pick it up pretty fasts if helped by others. Other MOOCs I’ve looked at are aimed at those at school (High School in England) to help them with university entrance and preparation, I’ve mentioned an MA even PhD level MOOC while the Exploring Filmmaking would have been on TV in the past. EdX won’t let you in without paying. Udemy is getting a dreadful reputation. Lumesse is a corporate platform a bit like FutureLearn. A gem of a Free Course from FutureLearn that has just started is ‘Exploring Filmmaking’ with the National Film and Television School. As you’d expect the value are top notch. A great mix. Bitesize learning. Great discussions. 90 mins to 2 hours a week – a lot more if you get deeply engaged. I have been studying full-time for a year – an MA in a traditional university with lectures, book lists and online completing eight MOOCs and even trying to start a module with the OU. My goal hasn’t been simply to gain yet further qualifications in subjects I love, but to experience first hand the variety of approaches to learning that exist. Back to the classroom while learning online. The MOOCs I’ve done on FutureLearn are highly ‘connected’ – I believe the way huge threaded discussions are managed and can be managed successfully recreates what some consider to be the Holy Grail of learning in HE, the ‘Oxbridge tutorial’ where a subject expert sits one to one or at most one to three to discuss a topic, set each other straight, and then return every week, or twice a week to do the same. Experience and research shows that even in a MOOC with 25,000 starters, in a threaded discussion that has 3000 posts, that groups of learners form – typically a mix of experts, keen learners with some knowledge and complete beginners. These groups can last the duration of a two month course and spill out into other platforms and meeting up face to face. John Seely Brown called this a couple of decades ago ‘learning from the periphery’, where new, keen learners gravitate from the edges to the centre. It is learning vicariously, as we do in our day to day lives. But it is more intimate than a community of practice: two or three people learning together in real-time or in a quasi-synchronous platform is like an Oxbridge tutorial. I had the privilege of attending these as an undergraduate and my father in law is one of these career Oxford fellows who taught in this way for several decades and has gone to great lengths to explain the unique qualities of the method, how and why it works. It now works online. You don’t have to be communicating directly with the lead academics – though you may do in a MOOC, but you can gravitate, with ease, if you like to the many experts who are in and contributing to these forums. I can cite examples of both types: the extraordinary care and fluency of the PhD contributors to WW1: Aviation for example, or in the massive (25,000 participants) threads of Start Writing Fiction. This is ‘transitional education.’ Not a revolution, just building on the best of what has gone before and gradually taking others along with it. I like that after 700 years of keeping the approach to themselves that the ‘Oxbridge Tutorial’ as a way to learn is, online at least, open to anyone. 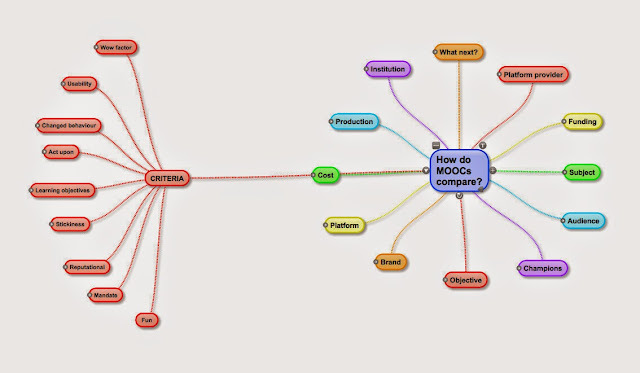 January 22, 2015 12:43 pm / 2 Comments on How do MOOCs compare? Fig.1 Unexpanded mindmap using ‘SimpleMinds’ on ‘How do MOOCs compare’. There are tens of thousands of Massive Open Online Courses available. Their proliferation increasingly requires some means to differentiate types, to standards, and by review. Undoubtedly branding will have a role to play: it being easier to choose because the subject is delivered on a known and trusted platform, such as Coursera, Udemy or FutureLearn. What are they brands though? Like a well-known publisher such as Dorling-Kindersely? Or a brand of cornflakes? Courses are often the product of a specific university, but does this help when a course will vary also by faculty, and in particular by the role and lead taken by a subject matter expert. There are a couple of review sites which aggregate MOOC lists, such as MOOC List and CourseTalk. These, like reviews on Amazon, rely upon participants of a course to come in a post. I think of it as the TripAdvisor for e-learning. How reliable are these? It’ll take years to bed in and impact on the product. There are too many for one person to consider. And ample complexity requiring parameters. Some are not, or are no longer Massive and Open because they are closed, exclusive and paid for. Udemy has many thousands of short courses online, all with a price for participation, self-paced and lacking a sizable cohort to generate valuable ‘connectedness’ and ‘collaboration’, both important, identified theories of learning that have a significant part to play in e-learning. Funded by venture capital Udemy needs cash flow. EdX comes from Ivy League US universities Harvard, MIT and Berkeley offering undergraduate and postgraduate level, term long courses at a demanding academic level. They have no UK equivalent: neither Oxford or Cambridge have come on board. Although Edinburgh is on both EdX and FutureLearn. Whereas LSE and a few other top UK players are yet to have a presence. FutureLearn is a new, though rapidly expanding player: a wholly owned subsidiary of the Open University with partner institutions from around the globe, typically the UK and Commonwealth Countries, though with three partners from China too. It is the platform I am most familiar with having complete six MOOCs with another four on the boil. They make it look easy and I love learning in conversation with others. The Khan Academy is aimed at schools, while the likes of TED lectures, iTunesU and podcasts are all lectures online in one form or another, rather than complete courses with clear steps towards achieving specific learning objectives. I am attempting to compare platforms, approaches and institutions by comparing delivery of MOOCs on Climate Change. There are probably a dozen, all variations on a theme, though the science shouldn’t be different, even if the delivery is. They are: Exeter on FutureLearn, Melbourne, San Diego, Penn and British Columbia. I studied geography as an undergraduate so feel better able to form a judgment. Funding is complex, but it matters because ‘he who pays the piper, plays the tune.’ Largely funded by VC money the US MOOC providers are pressured to take fees, seek donations and sell certificates and other services. To a Brit used to the BBC anything with advertising in it, especially in relation to learning, smells of hogwash. On the other hand, branding and open sponsorship may be a necessary way forward. Even Wikipedia cannot do it for free. Once again, my knowledge is in the first instance at first hand as a ‘participant’ who has studied ‘at a distance’ with the Open University and paid for it, who has taken courses as CPD the traditional way at evening and weekend workshops, though also online by subscription. I have even paid heftily for a formal assessment which gained me a distinction and 10 credits towards a university degree. There is no ‘free’ learning: it is financed somehow. Learning takes time and therefore to plan, produce, put online and support. Even where the cost is carried internally as the learning is seen to have promotional or reputational value, it is coming from someone’s budget. The relationship between the OU and the BBC, and the BBC and other British institutions is an interesting one as the assets the BBC creates by definition are owned by the tax payer so should UK citizens pay twice for something they have already paid for? The BBC though, like many others, create and provide content for use in learning under a Creative Commons licence. Funding, in tertiary education, comes from many sources, not least government subsidy, grants for research and sponsorship. Creation of Open Learning meets criteria, especially in relation to research, to publicise and share research findings. The dry academic paper is being superseded by, or at least complemented by, online offerings: a podcast at least an Open Educational Resource (OER) at best. I resist calling those who do MOOCs students because their profile and behaviour of those I have done and studied is not of students, whether from school, at university or postgraduate. They are older, but not ‘adult learners’, far from needing the education, many have a Masters degree … it is telling that discussions are anything but deferential towards the ‘young’ professors and even younger PhD students who present and moderate many of these MOOCs. Often the MOOC participant, who form the kind of TV audience that sits forward and interacts, is an MA student of the subject who may have ten or twenty years applied experience of the subject in business, government or teaching. For example, the MOOCs I am looking at on Climate Change always have vocal participants who have considerable experience ‘in the field’ for environmental agencies or oil companies. The academics are put on the spot, always rise to the occasion, and will surely learn from the experience as much as we ‘students’ do. Where therefore diversity and access? As TV producers know how in a digital world to cater for audiences of different ages and interests, so educators creating MOOCs will need increasingly to engage media professionals who know better how to target, appeal to and retain specific audiences. Whilst those creating MOOCs may wish to attract potential students to their undergraduate courses, I suspect that it is at best the teachers of such students, rather than A’level students who are getting involved. Reputations of innovators in e-learning and whose talks go viral in a TED lecture become champions of online learning. Some become a brand that tens of thousands turn to. As free courses proliferate the bluntest and most effective branding is to have a champion, the educator at celebrity. We know that those with a TV profile with a following already will attract the most interest. In TV, even in corporate learning and development, the appeal of the broadcaster or presenter speaking on behalf of the educators is common place. Not all educators are broadcasters. It matters to have someone champion the course. If you want to study, for example ‘Climate Change’ and can choose between a dozen providers of a MOOC, who do you go with? In formal learning objectives are the goal on which the learning is designed and assessments are undertaken. You are tested on what you are taught, and if you can prove that you have learnt what the material teachers you gain a grade of some kind. This in turn goes towards a qualification, or transferable credits towards a degree or diploma. This may appear clear, but there are other objectives at play: attracting students, even dissuading them if places are hugely oversubscribed. There are obligations to publish research. There are desires to join the ‘e-learning race’ and gain insights through doing even if it is not yet fully understood where the movement is headed. What does the course provider want from a MOOC? More students? Establishing or developing the reputation of an educator or department? Competing with others who are ‘up there’? Because they have the funding? Vanity? Not to miss out? The digital world is a free for all. It is competitive. Whatever you can imagine, someone is doing it. I was staggered to learn that the MOOC providers couldn’t be named on the fingers of one hand. I think there are over 50 if you’re counting and include various hybrids and anomalies. Many, many more if you venture into MOOCs that are not massive, or open … say content created for internal use across a huge multinational. Sometimes these commercial sites and platforms are the most innovative, and of course, the best funded, for example, in supporting training in investment banking for brokers. Virgin produces e-learning for internal use – it is surely a natural step to create something open and online? The OU, with the BBC and at arms length FutureLearn makes a compelling, reputational sound brand. If anyone knows how to create e-learning that is attractive, appealing and of value this is the team. There are cultural differences though with MOOCs out of North America looking more like a multi-media version of Scientific American to the FutureLearn MOOC that is ‘Look and Learn’ – fun and accessible. My expertise does not lie in picking apart and comparing the underlying technologies that support the different platforms. I can however relate to the discussions that have, for example, explained Facebook’s success compared to MySpace … that there were, or still are, underlying technical problems on MySpace that prevented its becoming as attractive as Facebook. I have taken and followed learning online since 2000 – joining the MA in Open and Distance Learning (MAODL) in 2001 while creating online learning through a web agency for commercial, broadcast and government clients. Our understand and aspirations for what was needed or could be achieved fell short of what bandwidths and the technology then could deliver, even if we spoke about ‘stickiness’, collaboration, likeminds and fun. The OU boasts that a multi-million BBC production such as ‘The Blue Planet’ is the kind of visual extravaganza it can now incorporate into, or complement with distance and online learning, a far cry from the black and white hippy in sandals presenting in front of a whiteboard as lampooned by Smith and Jones in the 1980s. It isn’t as simple as saying costs, like those in the movie business, are divided between creation and distribution, though it is a useful starting point. In this instance the means of distribution is an interactive platform, that has certain affordances because of its underlying architecture and the skills, direction and motivation of the programmers. The content that is made available for, or put into this environment will vary widely based on the experience of the educators, the team they have around them, and how this is structured and led. In TV and print, a producer or publisher is the lead, or chair of such a group … not the ‘creative’ whereas in academia the academic invariably feels they are the lead and should instigate decisions, sometimes without acknowledging that they have no expertise in ‘external communications’ or the platforms and approaches they want to adopt. Money is not set aside to use an external producer or production team, with sometimes, the results being self evident. Fine, perhaps, in a former age, for an internal audience of undergraduate students, but no longer adequate for a far more demanding open audience. Multimedia, which is what this is, draws on expertise that is a combination of skills that in the past would have been more easily denoted as radio, conference, print and TV. Production values and experience in all of these is required when creating online content because decisions should be taken in the context of the learning materials as to what will work best at different times, for different kinds of content. Also recognising the need for varieties of approach and making these appropriate. I have taken, or tried to take, modules that are back to back presenter to camera, as if listening and note taking for many hours is an adequate or doable learning process. On the other hand, I have been engrossed by an entirely ‘gamified’ Rosetta Stone as an iPad App – rich, complex, repetitive and at times tiresome, but effective as a language learning experience. Not all, or rather few educators, are natural broadcasters. Accepting their strengths in front of a lectern and not taking them out to walk and talk or present on location unless they can clearly do it, requires production skills. There is a language for conducting interviews using a single camera, and for recording multi-camera seminars. If the technician who sets up the kit has no understanding either of framing, or of editing, the result, however good the lighting and sound, will jar. These are all production values that need have to be bought in, or developed to a suitable standard inhouse. Audiences have expectations of certain practices across the media types. Poor practice in use of PowerPoint, for example, is not simply distracting … people will quit a course on a whim. Increasingly leading players in many fields are coming to see that to offer open learning online is a natural progression from things they have already been doing for a decade: putting content online in websites. delivering short courses face to face, even recording podcasts for release as audio or video. There is less mystery behind how to create content and less need for owning and financing the platform. What we are seeing today, is the same transition that occurred as blogs migrated from do-it-yourself coded webpages in 1999/2000 through the first readymade platforms such as Diaryland and LiveJournal, to the ‘off the shelf’ ease and sophistication of WordPress. Indeed, for MOOCs, the commercial platform Udemy is offering a platform to commercial players. Institutionally could early adopters trump the laggards? Might the likes of Phoenix and its global reach of associated universities trump traditional hubs of learning like Oxford and Cambridge which are currently proving reticent to engage? Or will inertia, reputation, funding, research and expertise see them grow into e-learning and their substantial foundations? Whilst it may appear that the Open University was made for the digital age, can a UK institution be a global player? What happens when an Oxford or a Cambridge can do what the OU does? Or don’t they ever want to? Over the last 35 years the percentage of students at Oxford from private schools has shifted from 72/28 to 48/52 …. still not representative of the national split, but moving with determination to being accessible and diverse. Ironic then that staying out of online learning is perceived as necessary to preserve their tradition of tutorial based learning that by its very nature can only be elitist and exclusive. There will be unforeseen consequences. Will ‘leasure learners’, a stalwart of the OU migrate to MOOCs where there are no fees, just as much learning and a far greater sense of community engagement? Will MOOCs, as the OU does with an MAODE module, be something that runs in parallel with a formal module. In this instance students in the closed learning MAODE being joined by an open MOOC audience for a period of months. I can envisage an enlightened educator using his/her MOOC to support self-directed learning online, while also acting as the backbone for a formally taught series of classes where they use the readily package content of the MOOC to support their delivery. Those who want and need the kind of learning the MOOCs offered do not make up the bulk of the audience. How will those young people coming out of higher education who crave a university degree learn at this level when they don’t have the funds to attend in person? How, when it comes to assessment, can they afford what remains an expensive process – sitting an exam or submitting a paper for formal scrutiny and grading under stringent criteria relating to potential plagiarism and to sustain standards? For all their openness and credentials to support access and diversity do MOOCs simply ‘preach to the converted’ – refreshing an interest for those with a degree, or two, already? Where might a degree taught online be achieved instead of a set of A’Levels. Will it become normal to have more than one degree so raising the bar even higher for those who simply wish to get to first base? Is there, as was in the earliest stage of the Internet, a language bias with most MOOCs invariably delivered in English? Restricted access. Poor broadband. Lack of resources to run the MOOC. Lack of means, either time or money to do them. Stickiness: Are people suitably engaged to stay with it and beyond? Fig.1 Alice in Wonderland pOp-Up. FutureLearn MOOCs are as easy and as pleasurable to do as a child turning the pages of pop-up book on Christmas morning surrounded by friends and family. Engaging. Puts a smile on your face. Teaches you something. Leaves you wanting more. What content is presented and the way it plays out changes things. The interaction with others matters massively. My interest is e-learning. A decade ago it was web-based learning and before that it was online learning … as compared to ‘offline’ learning on an intranet or in a computer learning centre. Across this period, whether on Laser disc, CD-rom, DVD, or online the key words to describe a successful piece of learning might include: easy to use, intuitive, effective, measurable results, gamified and impressive. ‘Impressive’ for a corporate client has always been important – they want to see how their money is spent. It matters to jazz a thing up, to find a way to deliver exception creative qualities in both the ideas and the execution of these ideas. In H.E. this ‘impressiveness’ has been thin on the ground the experience and view of H.E. that someone talking to camera with a slide show or whiteboard will do the job; it doesn’t, not any more. What are you like? – Gold Award Winner at the IVCA awards. An interactive life and career guide for teenagers done in the style of ‘In Betweeners’ and ‘Some Girls’ – nailed the audience with creative tone and visual effects. This won BAFTAs, the IVCA Grand Prix and NMA Effectiveness Awards. Ideafisher – first on floppy discs, then a CD. It did in the 1990s what various websites do today by linking vast collections of aggregated ideas and concepts that it filters out and offers up. The closest I’ve felt to AI for creativity. MMC – online marketing courses. These were, for me, in 2010, an early example of stringing the face to camera lecture together with course notes to create a course. Still more like a self-directed traditional lecture series but the volume of content was admirable and some of the tools to control the viewing and reading experience were innovative. TED Lectures. Are they learning? Or are they TV? Are they modelled on the BBC’s Annual Reith Lecture series? Top of the Pops for the lecture circuit so tasters and Open Education Resources for grander things. Pure simplicity. I love these. I gave a year to an intermediate course in French, learnt some grammar and fixed several problems with my pronunciation. Like that game ‘Pairs’ you play as a child: a pack of cards with pairs of images on one side that you pair up. With considered, only sometimes over art-directed photography. Repetitive, always in the language you are learning. The next best thing to being dropped in amongst native speakers as an infant. It just works. iTunesU – The History of English in One Minute. Not so much a course as a series of stunning and memorable cartoon pieces that galvanise your interest. The next step is to follow through with a free trial course through OpenLearn and perhaps a nudge then towards a formal course with the Open University proper. FutureLearn – the entire platform. As easy as reading a book. I’ve done eight of these and have another three on the go (two for review rather than as a participant). Across the myriad of subjects and offerings there are differences, all gems, but some are more outstanding than others. It is no surprise that those MOOCs (Massive Open Online Courses) produced by the Open University are some of the very best; it’s what you’d expect with their experience. Other university’s shine through for their confidence with the the platform too, for example, ‘How to read a mind’ from the University of Nottingham. I may have been through this a couple of times in full and now dip back into it as I get my head into gear. I’ll do this as often as it takes to get the thinking to stick. It’s working. I read as a writer. I will interrupt a story to pick out how a succinct character description works. I’m also chasing up a myriad of links into further Open University courses and support on creative writing. For example: next steps, creative writing tasters, and audio tasters on iTunes. Fig.1. My mash-up from the Start Writing Fiction, OU and FutureLearn MOOC. Many weeks after the Open University MOOC on Future Learn closed ‘Start Writing Fiction’ I find I am returning to the many activities across the eight weeks to refresh, reflect, and build on my knowledge. As well as doing my bit for that ‘community’ by doing a few reviews (all assignments are peer reviewed). I completed the course in early December. I return to reflect, to develop ideas, to be reminded of the excellent lessons I have learnt there, and in particular on how we use fact and fiction, whether consciously or not. In pure fantasy writing I find, inevitably, that I ground events in places I know from my youth, or have since researched. I use the hook of reality and my experiences on which to build the fiction. While currently I am embedded in what started as 90/10 fiction to fact I find it is increasingly looking like 95/5 in favour of fact as my imagination is close to the truth about a particular character and his experience of the First World War. All this from a simple exercise in week one called ‘Fact or Fiction?’ where we are asked first of all two write something that contains three factual elements and one fiction, and then to write something that contains three fictional elements and one factual. There are thousands of these now, many very funny, original or captivating. In week one, I’m guessing that around 10,000 got through the week. How many posted? There are 967 comments. This happens. It is an open course. The same applies for most web content: 95:5 is the ratio of readers to writers. Many people prefer not to do what they feel is ‘exposing themselves’ online. Why should they. Anyway, this gives me reason to argue that it is an excellent idea to keep a blog of your OU studies. All of this can remain private, but at least, as I know have in this blog, when the doors close behind a module you can, months, even years later, return to key activities and assignments and build on the lessons you learnt. More importantly, as we all forget with such ease, we can keep the memory of the lessons fresh. Fig.1. My mash-up of a correct answer to a quiz in the FutureLearn course from the University of Nottingham ‘How to read a mind’ that ties in directly to The OU course on the same platform ‘Start Writing Fiction’. As these MOOCs complete I have a few weeks over Christmas to reflect on a busy year of Moocing about and to catch up with regular coursework on L120, assisted with a necessary business visit to France. My MOOCing is enjoyed all the more while reading Martin Weller’s new book that covers MOOCs, ‘The Battle for Open’. These are interesting times indeed. With friends yesterday I evangelised about MOOCs on FutureLearn and found that what worked was to describe a MOOC in layman’s terms as the equivalent of a hefty, hardback, coffee-table book you buy because you have an interest in a thing. Let’s say it is architecture. The book is written by an expert with engaging photographs, charts and maps. From time to time you indulge yourself. A good MOOC is similar, different and better. Online you have an expert who leads the course. The introduce themselves, the course and perhaps the team. And then over the weeks they drop in to say something with a pre-recorded video piece or text. They may even appear from time to time to contribute to the discussion: though you may miss them if the thread is running into the hundreds. I explained how threaded discussions work: that there can be thousands of comments, but you know everyone is talking about the same thing. That if you don’t get a point you can ask and someone offers a response. You may still not get it. So you ask again. Once again, there is a response. You may do this a few times. Even come back to it a day or so later, but you are likely, eventually to see something that says it for you – your fellow students have fulfilled the role of the tutor that a tutor could never manage: they only have one voice and they can’t give up the huge number of hours – there is one thread in ‘Start Writing Fiction’ that runs to 7400 posts. These are filtered in three useful ways: activity, following and your comments. In this way you either look only at the lates posts, the posts of those you are following: say 10 out of 23,000 or, of course, you look back at your comments. As for my graphic? Does obscuring the writing assist with anything? By making an effort to read the question are you any more likely to remember it? 100% Coming out of the MA in British Military History with a Postgraduate Certificate and 60 credits after one year it was good to take part in something carried by a leading academic. A challenge is worth taking on when there is something new to learn and understand. The WW1 theme hooked the interest and most students expected to stay there. Even if off my brief I was nonetheless happy to go the distances stretching out through WW2 and the creation and early history of the United Nations.